In this article, you will learn 6 SEO tips to avoid Google’s over optimization penalty. I am sure you heard this before. And of course, you want to make your site show up on every keyword. You put a bunch of keywords on your business introduction. That leads to keyword stuffing. Keyword stuffing is an old SEO technique. You put every possible combination of the keyword you wish to rank on Google in your post or page. The extreme example will be the hidden keywords text buried at the bottom of the page with the same color as the background, so you cannot see them but they are there. Of course, that is an extreme example, but you get the idea. Even if you have no intention to do that, you could have accidentally over optimizing your website with too many keywords. And your site might get Google penalty. This technique used to work, but not anymore. When Google’s algorithm was not sophisticated, the technique was an on-the-go strategy for many online marketers and spammers. If you put more keyword, you had a better chance to rank your site. Many people did it. Google stepped into this problem. In April of 2012, Google started to penalize these websites that used keyword stuffing technique. And if Google catches you, they deindexed your website from SERP. It means that your website became virtually disappeared from Google. The keyword to avoid over optimization is “natural.” We know it is attempting to add extra-keywords in your article to make it boost. 1. Avoid using too much anchor tag on site internal links. An anchor tag is a strong ranking signal. If you add it, it will boost your ranking on SERP. However, it also works as a double-edged sword. If you repeat too many keywords on your anchor tag, Google knows you are trying to manipulate their system. Now you are one step closer to over optimization. This can be flagged as over-optimization. H1 tag has a special weight for optimization. Yes H1 tag is a powerful signal, but when you use multiple times in a single post/page, this becomes a problem. You can use H2 and H3 a few times. Just don’t use H1 more than once. 3.Keep your keyword for your niche. Back in days, if you want to make a website specialized in many topics, you can just add keywords and links to many topics and Google ranked your site on SERP. Unless you are news media or national directory site which covers general topics on a wide scale, your site doesn’t get listed in multiple topics anymore. It is not impossible, but you would need an excellent resource and put so much effort into it. Unless you have multi-million dollar budgets, do not try to become a new NYTimes site. The reason behind this is Google’s algorithm. Now Google categories your website and put it in a theme. If you make a link with a keyword that does not relevant your niche, Google often ignores the link. And if you start messing with many different keywords from different niches, it makes google confused. That is not a good practice. That’s why it is important to keep your keywords related to your site’s niche. 4. Too many outbound links to smaller sites and questionable sites. on your link a tag. By doing this, you can tell Google that, you are not associated with the link. Google does not count this link to influence your site. This is a simple strategy to avoid this negative SEO. If your domain contains a keyword that you want to rank, this helps your ranking. But sometimes people go too far. For example, if you have an ac repair business and want to rank ac repair in Los Angeles, you could pick up a domain called “losangelesacrepairservice.com.” It contains many of keyword you want to rank. However, it does not have any branding power. Your domain might work for Google for now. But, Google changes its algorithm often and sometimes, it decides to discredit these domains that have too many keywords. Hopefully, your website domain is not keyword optimized too much. That’s it! These are the 5 ways to avoid over-optimize your website from Google penalty. I have a special e-book for you to download. 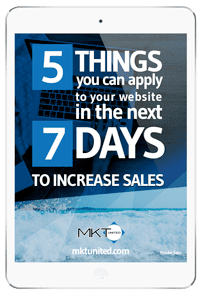 This ebook gives you 5 practical guides you can apply to your website for the next 7 days to increase the sales. If you are interested, go and check it out! Yosuke Sato is a SEO expert and Wordpress consultant at MKTunited SEO agency. He has been working with Wordpress over 10 years and business consultant for a number of years.